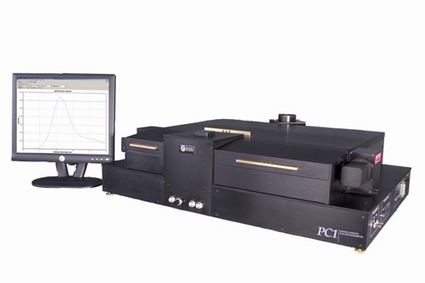 PC1™ is a very sensitive, compact, computer-controlled Photon Counting Spectrofluorimeter designed for applications in physical chemistry, biochemistry, physiology, neurochemistry, molecular biology, environmental analysis, and immunoassay research. For a comprehensive list of PC1™ users, click here. The compact design optimizes the light path so that the sample compartment receives the maximum possible excitation light. The end result of the compact design is an instrument with an outstanding ability to measure fluorophores with very low quantum yields. Instrument control and data acquisition are PC-controlled through Vinci. All active instrument components and integrated external devices are displayed on the Instrument Control Window in Vinci. From here, the user has direct remote control over all devices and accessories. PC1™ has the capability to integrate external devices such as a stopped flow accessory, temperature bath, flash lamp, pressure pump, and a titrator. Any of these devices can be directly controlled through Vinci. Vinci - Multidimensional Fluroescence Spectroscopy software acquires data in ASCII format for maximum compatability with other software packages. Data files can be stored directly on other workstations connected to a local area network. PC1™ is fully upgradable to a time-resolved fluorometer to acquire time-resolved fluorescence and phosphorescence measurements with picosecond resolution. A variety of light sources and other accessories are available for a broad range of applications. Using a XYZ piezo-controlled stage; the beam is set at a position while the sample is moved over the beam (stage moving microscope). Galvo-controlled scanning mirrors offer the best solution for fast imaging acquisition in a laser scanning microscope. The mirrors are housed in a unit that includes a rotating wheel mounting up to four dichroic mirrors and a descanning lens. Both single photon and multiphoton excitation can be utilized with the unit; for single photon excitation, light is brought to the unit by a single-mode fiber optics (3.5 µm diameter) with SMA connector. The XYZ PZT is an actuated linear nanopositioning stage of exceptional resolution and stability. The 2.6" x 2.6" hole in the stage center is ideal for applications involving transmitted beams, multiple probes or inverted optics. With its large distance of travel and high stability, the PZT is ideal for the most challenging microscopy and positioning applications. The PZT comes complete with position sensitive detectors for closed loop operation. A variety of sample holders can be accommodated on the stages provided by ISS for Alba. A few popular examples are shown below. For developing a custom holder contact the ISS support department. Coverslip are the most common support for samples in microscopy. The picture shows a coverslip mounted on a XYZ piezo stage. Holders (complete of lid) for using the coverslip on a manual stage are available too. Petri dishes can be accommodated on XYZ piezo-controlled stages and manual stages. Holders that can accommodate two dishes are available too. They are useful when measuring FRET on a cell; a dish contains the cell expressed with the donor and the second dish with the donor-acceptor pair. A computer controlled XY stage is available for applications requiring the use of 96- and 384-wellplates; its operations are fully integrated in the VistaVision software. A typical application of the device consists in the sequential FCS measurements of the wellplate. The user includes the well to be measured. The software positions the first well on the laser beam and acquires the measurement; then the second well is brought into position and a second measurement is acquired. The entire operation is fully automated and it does do not require the presence of the operator. Similarly, lifetime measurements on the content of each well can be acquired sequentially and stored. The polarizer's transmission is maximized for the wavelength range 450 nm to 1100 nm. The extinction ratio is 10,000:1 at ±3 degrees. The polarizer is mounted into a cube on the automated filterwheel (it accommodates up to 4 optical elements) and is selected through the software. The 50/50 beam splitter transmits in the range 380-750 nm. The beam splitter is mounted in a cube on the automated filterwheel (it accommodates up to 4 optical elements) and is selected through the software. The ISS ALBA confocal unit mounts the filter cube for 18 mm filter by Nikon. Such filter cubes are available through ISS or through Chroma Technology (Model 91000). The cube is mounted on the automated filterwheel (it accommodates up to 4 optical elements) and is selected through the software. The Nikon microscope Model TE2000 mounts a 25 mm filter cube (Chroma Model 91020). The 3XDAC card is designed for controlling galvo-controlled servo mirrors or XYZ piezo-controlled devices utilized in fluorescence microscopy. FastFLIM is the new digital frequency domain (DFD) approach to FLIM measurements. A unique data acquisition card for Fluorescence Correlation Spectroscopy (FCS) applications. The data acquisition card by Becker and Hickl, GmbH. Compete TCSPC systems on PC Boards. Two detectors are mounted into the unit. Typically the detectors are Single Photon Counting Avalanche Photodiodes (SPADs), or Photomultiplier tubes (PMTs). Other detectors can be used as well (hybrid PMTs, microchannelplate MCP detectors). The fluorescence light is brought to the unit from the confocal head of the microscope by using a multimode fiber (50-100 μm diameter) with FC connector. ISS offers a variety of laser launchers to accommodate lasers of various sizes and shapes. Each laser launcher can accommodate up to four lasers. Each laser can be turned on or off independently. A variable attenuator for regulation of the laser intensity and a shutter are mounted in front of each laser diode for controlling the relative intensity delivered to the microscope. The lasers beams are aligned and superimposed using dichroic mirrors and focused onto a single-mode fiber (3.5 μm diameter) which brings the light beam to the microscope. The ISS launcher uses the KineFLEX™ fibers coupler system and fibers made by Point Source Ltd. (United Kingdom). The fibers feature collimator lenses permanently attached to the input and output; the lens and the fiber are assembled in a cylindrical adapter that is inserted into a fiber manipulator attached to the laser launcher. This unit accommodates up to four lasers diodes that can be utilized simultaneously or one at a time. Radio frequency can be injected into the laser launcher for modulation of the lasers intensity up to 500 MHz. The Hybrid Laser Launcher accommodates one argon-ion laser, two HeNe laser and one laser diode or solid-state laser. For applications requiring the modulation of a light beam, an electro-optics modulator is mounted in the laser launcher. The Hybrid Laser Launcher is self-contained and its operations are controlled through the USB port of a computer. The unit also includes a general power supply. 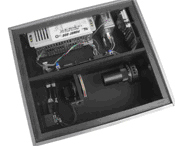 The Intensity Controller allows for the control of laser power diverted into the microscope. The beam from the laser goes through a rotating half-wave plate and a Glan-laser calcite polarizer. The intensity of the output beam is regulated by rotating the half-wave plate.The rejected portion of the beam is absorbed by a beam dumper. The unit is connected through the USB port. An automated beam steering device allows for control of the laser alignment through the computer. Stepper motors are mounted on each mirror and allow for fine control of the azimuthal angle. Ultra fast mirrors (with low GVD) are mounted. Get complete control of the automated devices on all Alba instruments, (shutters, filterwheels, XY stages, and fine positioning of the light detectors). VistaVision for Alba is a complete software package for instrument control, data acquisition and data processing.